Reading remains solidly popular in America, with the latest figures from Pew showing that print book readership remains at same levels as they were in 2012: about 74% of Americans have read at least one book in the past year: 67% of readers have read at least one print book. Ebook growth remains stalled, but audiobook consumption is rising to compensate, with almost one in five Americans having listened to an audiobook in the past year. Audiobooks enjoyed strong growth in 18-29-year-olds (23%, up from 16% in 2016), as have rural adults (17%, up from 10%), and college grads (16%, up from 9%). Ebook-only readership is very rare: only 7% of Americans identify as ebook-only readers (it's 10% for Americans 18-29 years old). 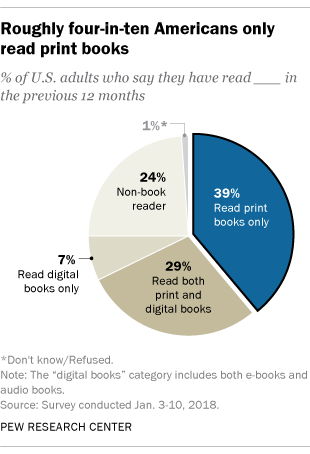 Ebook-only readership does not vary with educational attainment, either. The growth of audiobooks is pretty fantastic news, with one fly in the ointment. The market is almost entirely controlled by Audible, a division of Amazon, who have a mandatory DRM policy that publishers cannot opt out of. That means that nearly all of the audiobooks sold in America are locked in a format that Amazon controls, and that means that Amazon has the power to change the rules on those books whenever it wants, de-listing hardware players, or revoking access or features. And since DRM is protected by EU and US law that can subject security researchers to criminal and civil liability for revealing defects in products, every devices that can play an Audible title is a potential reservoir of long-lived digital pathogens that both criminals and good guys can discover, but only criminals can do something about. That may be changing: Google recently rolled out a DRM-free Audible alternative, and companies like Libro.fm and Downpour offer a fantastic, DRM-free indie alternative to Audible, selling the same titles at the same price, but without the DRM. And of course, I'd be remiss if I failed to mention that you can get my audiobooks direct from me, DRM- and EULA-free, read by the likes of Wil Wheaton, Amber Benson, and Bronson Pinchot.